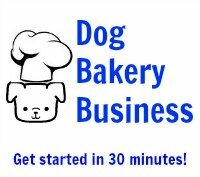 Use these dog treat bakery business marketing tips to help boost your visibility if you plan to start a pet bakery business or other pet services business. Dog treat bakery business marketing applies to other pet services too! If you have a dog grooming service, a dog training service, do dog walking, pet sitting business, or even to promote a dog boutique, thanks to the availability of quick and easy cake mix for dogs and dog treat biscuit mix, you can create easy homemade dog treats, package them creatively with your dog treat bakery business or other pet service business contact information, and send your business name out into the world. 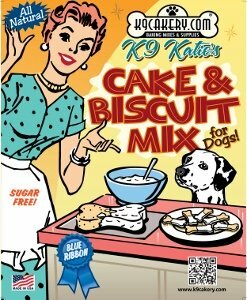 A very easy way to do this is to use a silicone paw print pan or a silicone dog bone cake pan and make small dog biscuits. Decorate them simply with different colored dog treat icings. The mini paw prints catch people's eyes because they are cute and different. The paw print has become a ubiquitous logo for many dog businesses, so when you present an actual dog cookie with dog icing "painted" toenails, you will elicit oohs and aahs. Place one dog cookie into a plastic bag and attach your business card or a label with your website and/or email. If you prefer phone calls, then use that information. The point is that you want to make it easy for customers to get in touch with you. Email contact is popular because you can answer the inquiries at your convenience. If you are a one-person service, you may be busy with a current customer and not be able to answer a phone call. Answering emails within 24-48 hours is acceptable (the sooner the better). You can wrap the package with dog-themed ribbon, or even punch a hole in a card and tie it on with the ribbon. Anything to make an interesting, attractive package will work. People love presents and gifts, and you are essentially creating a personal gift that will benefit both pet owner and pet. These packages are marketing pieces. Use them the same way you would use a brochure. Brochures have a high probability of being filed in the circular file as it is called, but the dog biscuit will either be eaten in the potential customer's household, or passed on to another pet owner, which would be fine with you. If you are attending a meeting or a seminar, pass out dog treats with your contact information instead of business cards. Business cards end up in a pile in someone's drawer, but your dog treat package will be placed on the dining room table or the kitchen counter. So as you can see, marketing dog treats is not just about dog treats! Click to read a new blog about dog treat marketing for troubleshooting and specific questions.